“We saw yield increases of 3.5 to 7 bushels per acre in soybean lines derived from crossing with Glycine tomentella,” says Randall Nelson, study author and adjunct professor in the Department of Crop Sciences at U of I. The process of getting Glycine tomentella genes into soybean is highly complex. The two plants are so distantly related that any mating would ordinarily result in aborted seeds. But Nelson’s collaborator and study co-author, Ram Singh, developed a growth hormone solution he sprays on the young pods to keep seeds from aborting. “He rescues that little, immature seed, cultures it, and grows it into a plant. Then those are back-crossed repeatedly with the soybean variety ‘Dwight,’ until all of the Glycine tomentella chromosomes are lost and we recover a soybean plant,” Nelson explains. The group plans to map the genome of the promising plants, with the ultimate goal of identifying the genes responsible. Breeding efforts are already underway to develop higher-yielding lines since ‘Dwight’ is a 20-year-old cultivar. “Last year, we released a material transfer agreement that would allow any soybean breeder to cross with these lines. I was surprised we didn’t get many requests, because these are such unique resources. With this yield information, I hope we can get more people interested,” Nelson says. The article, “Genetic introgression from Glycine tomentella to soybean to increase seed yield,” is published in Crop Science [DOI: 10.2135/cropsci2017.07.0445]. Nelson’s co-authors include A. Akpertey, R. Singh, B. Diers, G. Graef, M. Mian, J. Shannon, A. Scaboo, M. Hudson, C. Thurber, and P. Brown. 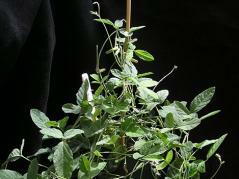 The work was supported by the United Soybean Board and the North Central Soybean Research Program.